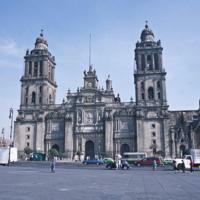 The metropolitan cathedral stands at the center of Mexico City. Under construction for nearly 250 years, the cathedral displays the visions of many architects and colonial officials. Because of this, the cathedral adheres to no single architectural style. The Cathedral rests upon marshy ground, as do all the buildings of central Mexico City, and it has settled unevenly. It has thus been the focus of many restoration and re-engineering projects into the 21st century. 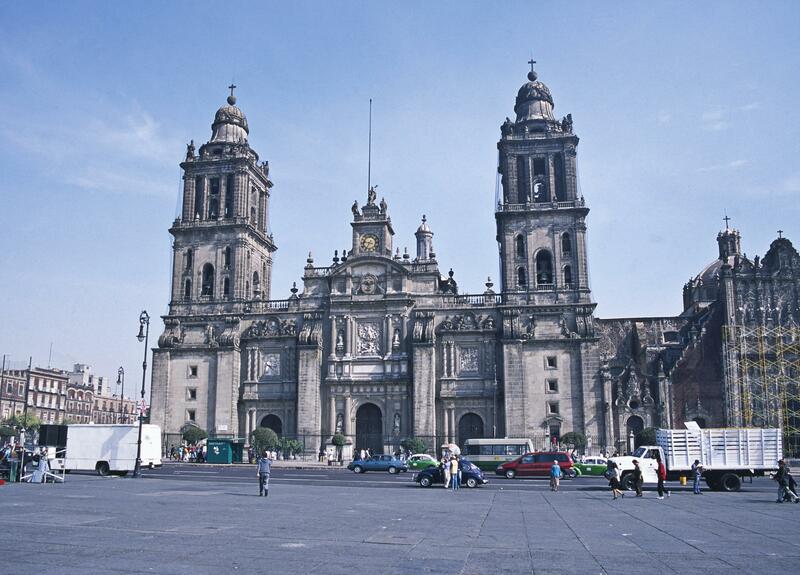 The Cathedral of Mexico City was the largest church building in the western hemisphere until the 20th century. For most of the colonial period, the towers were not complete. Only in 1791 were both finished. Added after them was the central tower, holding the clock. The famous Spanish-born architect Manuel Tolsá built it in the early 19th century. The main doorway opens onto the central nave. Opposite this doorway, in the apse of the Cathedral, is one of the most famous retables, or retablos, of Spanish America, the Altar de los Reyes (Altar of the Kings). It can be seen in Vistas. To the right of the Cathedral is the Sagrario, seen here under scaffolding during restoration in 2001. It was a parish church built ca. 1749-1769. As was the case in Lima and other towns laid out by the Spaniards, Mexico City’s cathedral fronts onto the town’s main square, now called the Zócalo. Many architects worked on the Cathedral. Among the most important are Claudio de Arciniega, who came from Spain to serve as the primary architect for Mexico City in the 16th century. He is credited with the ground plan and initial construction of the Cathedral. Later, Manuel Tolsá, who also came from Spain, served as Director of Works at the Cathedral from 1793 into the early 19th century. Among his contributions are the cupola, the clock tower and the sculptures atop it. The Cathedral relied upon the architectural insight of many, and the labor of thousands—stonemasons, iron-workers, carpenters, porters and those who would feed them. The cost was born by local residents and indigenous residents with assistance from the Spanish Crown. To support the massive structure, which rests upon a masonry platform, the soil below was reinforced with over 20,000 wooden stakes, each about 2-4 meters in length. The site is not far from the Templo Mayor, which had been the most important temple in the Aztec empire. It was dismantled after the conquest and some of its stones were used in the construction of the Cathedral. Fronting onto the Zócalo, or main plaza of Mexico City, the cathedral stood to the west of the Viceregal Palace, which also looked out onto the Zócalo. The first cathedral built in New Spain, the interior was dedicated in 1667, with the exterior reaching completion over 100 years later, in 1813 (after Mexico had declared its independence from Spain!). The size, location, and complex building history of the cathedral reaffirm its importance in both Mexico City and New Spain. As a house of worship that was supported by the Crown and housed many official ceremonies associated with heads of state, the cathedral was, as well, a primary public expression of the inextricable connections between politics and the Catholic Church in Spanish America.